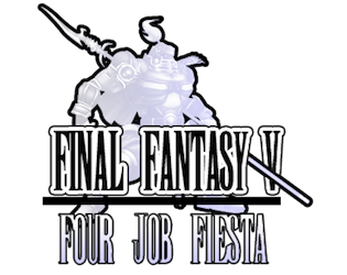 The Final Fantasy 5 Four Job Fiesta is a yearly event where gamers around the world play a challenge run of Final Fantasy 5 with special rules. Follow Gigabot and join in on the fun! Please contact revenantkioku with any questions or comments. Select and display your jobs. Change between Galuf and Krile with ⌘K. Set a black background with ⌘0 or swap between battle backgrounds with ⌘← and ⌘→. Enter your Twitter name in order to quickly open a link to your Fiesta page. Open up tweet intents to unlock Water, Fire and Earth jobs. Open up tweet intents for Victory tweets. Note: You will have to include a link to your image as currently attaching an image to tweet intents is not possible.